At 9:07 pm, due to fading light, play was suspended at two sets each. After resuming on Wednesday 23 at 2:05 pm, the record for longest match was broken at 5:45 pm. Isner and Mahut split the first four sets Tuesday, before it became too dark to play. They began the fifth set Wednesday at 2:04 p.m., and play was halted at 9:10 p.m., because of darkness. 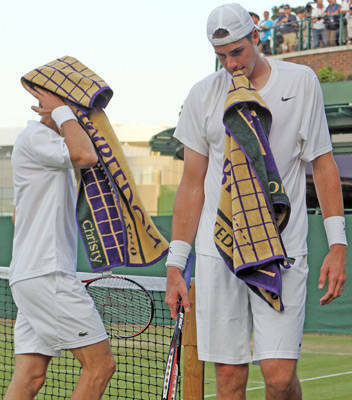 Isner and Mahut began Wednesday at 2:04 p.m., with Court 18 bathed in sunlight and in heat that topped 80 degrees. 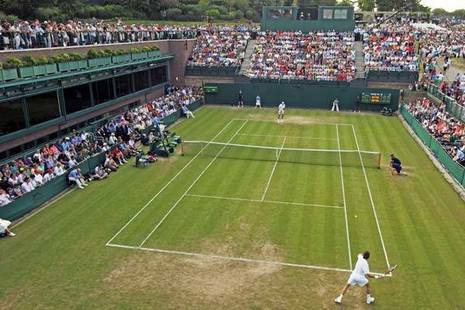 As play carried on shadows crept across the court, and the well-manicured blades of green grass along both baselines eroded away, leaving patches of beige dirt in their place.